Budai (Chinese:布袋) or Budai Luohan, pronounced Hotei in Japanese, also known as the Laughing Buddha, is the person who might be the next Buddha after Gautama Buddha. He has become incorporated into Buddhist, Taoist and Shinto culture and is based on a Chinese monk. He is in many temples, restaurants, and businesses. Budai has become a god of happiness and plenty, when taken in by Taoism and Buddhism. In Japan, Hotei is one of the Seven Lucky Gods (Shichi Fukujin). He is almost always shown smiling or laughing, hence his nickname in Chinese, the "Laughing Buddha" (Chinese:笑佛). Budai as shown in a print by Utagawa Kuniyoshi. Look at the bag in his hand. Budai comes from the time of Sakyamuni Buddha, where there was a monk named Angida, whose name also meant calico bag. In the legend, Angida was an Indian snake catcher who caught poisonous snakes to stop them from biting people. Budai and Angida look similar, they both are plump, seen laughing and carrying a bag. Budai is almost always shown carrying a sack, which never empties, and is filled with many precious things, including rice plants (which show wealth), sweets for children, food, and the sadness of the world. His duty is protector of the weak, the poor and children. In Chinese Buddhist temples, Budai's statue is put in the front part of the entrance hall. He is shown as a stout, smiling or laughing man in robes with a largely shown stomach, which shows happiness, good luck, and plenty. Some statues show small children at his feet. Another item that is usually seen in Budai statues, is a begging bowl; to show that he is a Buddhist. All of these images show Budai as a wandering monk who goes around and takes the sadness from people. Because he represents richness and happiness, statues are often found in homes and businesses in China and Japan. The main story that concerns Budai in Chan is a short koan. In Thailand Budai is sometimes confused with another monk very respected in Thailand, Phra Sandbagging or Shanghai (Thai: พระสังกัจจายน์). Phra Sangkadchai, a Thai spelling of Mahakaccayanathera (Thai: มหากัจจายนเถระ), was a Buddhist in Pali in the time of the Lord Buddha. Lord Buddha praised Phra Sangkadchai for his excellence in explaining complicated dharma (or dhamma) in an easily and understandable way. 1. Phra Sangkadchai has a bit of hair on his head while Budai is bald. 2. Phra Sangkadchai wears the robes in Theravadin Buddhist fashion with the robes folded across one shoulder, leaving the other uncovered. Budai wears the robes in Chinese style, covering both arms but leaving the front part of the upper body uncovered. 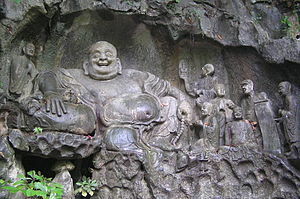 One belief surrounding the figure of Budai in popular folklore is that if a person rubs his belly, it brings wealth, good luck, and prosperity. This belief however is not part of any Buddhist ritual, but more of a Chinese practice. He is often admired for his happiness, plenitude, and wisdom of contentment.